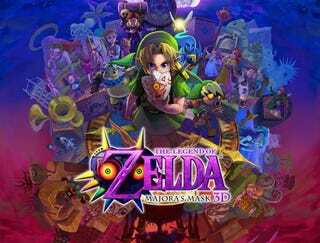 Two months ago, following the official confirmation that The Legend of Zelda: Majora's Mask would be returning in the form of a remake on the Nintendo 3DS, I went back to play the game as it was when it originally released fourteen years ago. I first played Majora's Mask in 2000, when it made its debut on the N64 just as the public was beginning to turn its eye towards the impending Sixth Console Generation (Gamecube, PS2, Xbox, etc.). At the time, I only had the slightest affiliation with the Zelda franchise - I owned Ocarina of Time, but hadn't beaten it at that point. And Majora's Mask was most certainly a different game from Ocarina of Time, and far more divisive than the 1998 classic. Featuring reused assets from the latter game, a darker atmosphere, multitudes of side-quests and a three-day cycle that required the player to reset the clock at the conclusion of 72 hours of in-game time or risk utter annihilation, Majora's Mask became one of the few games in the Zelda franchise with a legacy that remains, to this day, contentious. You either loved it or you hated it. I loved it, because I was still a child and back then, video games were fun no matter how bad they were - and fifteen years later, I still love it. But the reason I love it now is far different from the reason I loved it back then. Majora's Mask, at its core, is a story about loss. Majora's Mask is one of the few games in the Zelda series with the notable trait of being a direct sequel to the entry that immediately preceded it - in this case, Ocarina of Time. This likely contributed to the extraordinarily high expectations for Nintendo's final product for more reasons than one, but one way in which the continuation truly aids the game rather than hindering it is in the manner in which it gives Ocarina's Link actual character development. At the conclusion of Ocarina of Time, Link, having ventured across time and space to find a way to end Ganondorf's reign of terror in Hyrule, succeeded, with the help of Zelda and the Six Sages. Ganondorf was sealed away in the Sacred Realm, and a new era of peace began for the kingdom. Zelda decided that Link's reward would be to return to his own time - the time from which he was unjustly removed when he was frozen for seven years upon Ganondorf's entry to the Sacred Realm - so she took the Ocarina of Time, and with the familiar melody of Zelda's Lullaby, sent him back to his former life as a 10-year-old Hylian living among the Kokiri - forest children, who, unlike Link, would never age. Upon his return, the catastrophe that plunged Hyrule into seven years of darkness was averted - the Ganondorf of the past was executed before he could ever enter the Sacred Realm and take the Triforce, thus splitting the Zelda narrative into multiple timelines. And with this event, Link was now living in a world where most of his exploits over the course of OOT never occurred - most of the lifelong bonds he had formed over the course of the game were nullified, and the only people who knew of his exploits as the Hero of Time were himself, his fairy partner Navi, and possibly Princess Zelda. And then, after an indeterminate amount of time, and for reasons unknown to the player, Navi left Link's side and traveled off to parts unknown. This is where Majora's Mask begins. As the game opens, Link is traveling through the Lost Woods alone, with nothing but a sword, shield, and his trusty steed Epona to keep him company. But these Lost Woods aren't the ones we traveled through during Ocarina of Time. There's no festive forest music or scattered Kokiri in sight - rather, just Link, on his lonesome, searching for the fairy that left him behind. The atmosphere is already darker as well - very little light exists within these Woods, and virtually no sound is present as Link is introduced, save for Epona's hooves clacking against for the ground and the occasional musical flourish. If you've played the game, you know what happens next: The Skull Kid arrives, steals Epona and the Ocarina of Time, turns Link into a Deku Scrub, leaves him with one of the Skull Kid's fairy companions, named Tatl, and then flees for the nearby country of Termina, with Deku Link and Tatl hot in pursuit. The Happy Mask Man arrives, promises Link an escape from his Deku body, and introduces the concept of the three-day cycle. And thus the game begins. Link is a silent protagonist, and his thoughts on the events occurring around him are meant to be our thoughts - it was Nintendo's intention that Link be only a stand-in for the player, which is fine - but since this is truly a direct sequel to Ocarina, it has to be acknowledged that this particular iteration of Link, throughout the events of both Ocarina and Majora's Mask, is most certainly put through the wringer. And even that might be an understatement. The Happy Mask Man's first words to Link are "You've met with a terrible fate, haven't you?" And while that might apply to Link's situation in that moment, it can most certainly apply to his entire life up to that point. Link's parents died before his story even began, his mother's last act being to deliver him to the Great Deku Tree, hoping that Link could be raised peacefully among the Kokiri. Among the Kokiri, Link grew up an outcast, mocked by his peers for lacking a fairy for the majority of his early life - in Kokiri culture, fairies are essentially a birthright. They come to you, and are bonded to you from birth. Link, by virtue of his not truly being a Kokiri, didn't cross paths with Navi until the impending apocalypse warranted that they team up to defeat Ganondorf. On top of that, Link's eventual departure from the Kokiri, discovery of his true heritage, and subsequent victory against Ganondorf and return home all leave Link at a place where he has very few people left to call friend. He gets no recognition from the people of Hyrule for his heroism, and thanks to his own knowledge that he is now Hylian, Link can't possibly feel at home among the Kokiri. Despite everything he accomplished in the name of saving Hyrule and its people, Link loses everything he knows and loves in the process. And then the only person who can possibly understand his pain - Navi - chooses to leave him as well. And then, following all of that, Link takes on the task of finding his long-lost friend only to have his horse taken, an important keepsake from the only friend he has left stolen from him, and his very identity stripped away and replaced with that of a Deku Scrub. Link, by all accounts, should be broken at this point. And yet he keeps fighting anyway. Majora's Mask is the story of how Link fights on in the face of incredible loss. Saddled once again with the burden of being the only man who can protect the people in danger around him, stranded in a strange and unfamiliar land with a fairy that doesn't appreciate him in the slightest, Link fights on, choosing not to collapse in the face of his incomprehensibly bad luck. When analyzed from this perspective, Link becomes more than just the hero of Majora's Mask - he becomes a metaphor for anyone confronting grief in any shape or form, when sometimes the only thing a person can do in the face of loss is to move forward. The three-day cycle he relives over and over again throughout the course of the game could be symbolic of the process the grief-ridden face every day; one in which life can become nothing more than endless routine as one works through their pain. And that routine can be agonizing. The reason that Majora's Mask is a divisive game is because the three-day mechanic can only be reset by playing the Song of Time - a song that not only saves your game, but also depletes your entire disposable inventory and reverts the game world back to the exact same state it was in at the very beginning of the first day. The only items that are preserved are masks (an important series of collectibles that can impact the way your final boss battle goes down) and non-disposable items like the Hero's Bow or the Ocarina of Time. This makes the game infuriating for some fans, as it gives the illusion that no progress has been made throughout the entirety of your travails, but when analyzed from a narrative perspective, the mechanic almost seems worse. Across the course of the game, Link encounters several people in need of aid, their lives damaged either directly or indirectly by the Skull Kid's actions. Sometimes these are mandatory plot points, such as at the very start of the game, when you travel to the Southern Swamp to find it poisoned, a local witch gravely wounded, and the Deku Princess trapped within a temple - and an innocent monkey framed for the crime. All of these events are connected, and fixing them can usually take up a significant portion of the three-day cycle. Once the poisoned water has been purified, the witch returned home, the Princess rescued and the monkey cleared of all charges, you're most likely to be on the third day. Normally, this would be cause for celebration - and it is, for the afflicted. The Deku Palace breaks out in festivities, and the witch reopens her cruise line for business. But the clock is ticking. And when it hits zero, the entire country is going to be annihilated. So you play the Song of Time. And all is reset to as it was before. You're back in Clock Town, Termina's central hub, and it's the first day all over again. If you were to travel to the Swamp again, you would find the water once again poisoned, the Princess once again kidnapped, the monkey once again facing execution. Link's victory is useful in the long-term (he usually defeats a boss, gaining a mask and setting loose a deity that will aid him in his final battle against the Skull Kid), but in the short-term it means nothing. Happiness is fleeting in Majora's Mask, for the Moon that threatens to obliterate Termina at the end of the three-day cycle serves as a constant reminder that Link's victories are pyrrhic in nature. This is even more profound in the game's side-quests, the majority of which take place in Clock Town. They usually begin with Link discovering some innocent soul whose life has taken a wrong turn, more often than not as a result of the impending moon crash or the Skull Kid's trickery. Or, in some cases, it could just be someone going through a particularly difficult time in their life, and Link simply has the chance to brighten their day. For example, in one of the game's more muted side-quests, there's a man named Guru-Guru in Clock Town's Laundry Pool every night playing music on his phonograph. Guru-Guru is grieving the loss of his position in a popular animal troupe, and Link has the opportunity to listen to his tale of woe, at the conclusion of which the man will reach a moment of emotional catharsis. Grateful that Link has listened to his story, the man will grant him a mask and send him on his way, Link having given Guru-Guru the satisfaction of knowing that someone truly cares about his story. Link can do everything he can to alleviate the suffering of the Terminians in the short-term, but in the long-term, they're always right back where they started: suffering. And so the stakes are raised for Link: as he comes so close to making a difference just to have that reality ripped away from him each time he's forced to reset, he - and the player - are only more motivated to continue on their quest to ensure that these people achieve a happiness that's more lasting than the span of three days. He's fighting to give these people the ability to move past their pain and towards a future brighter than the darkness they're shrouded in. And when observed from this perspective, the game's conclusion becomes even more rewarding. When the long-awaited fourth day arrives, Link emerges from the wreckage of the battle he's fought stronger than ever, with a host of new people to call friends and the knowledge that his struggle is not meaningless - that in battling through his own pain, he's saved hundreds of people in the process. Guru-Guru performs at the carnival. A pair of dancers - the subject of another side quest - who once needed a master become the masters. The people of the Southern Swamp have finally achieved peace and stability, their water definitively purified, the Princess and Monkey saved. Happiness reigns. The light at the end of the tunnel has been reached. The darkest entry in the Zelda franchise ends on a message of hope.